Abstract - In today ' s world, there is a huge demand for cost-effective and portable thermometers. These thermometers are mainly used for domestic and medical purposes. In this project, we propose a compact and portable design of a digital thermometer for such domestic and medical uses. We have used 1N4148 diode as a temperature sensor and Ngspice as a tool for simulation. The temperature coefficient of the diode, -2 mV/Â°C is exploited for this application to create an accurate digital thermometer. 1N4148 is able to operate as a temperature sensor in the range 0 â„ƒ to 160 â„ƒ. The diode is connected as feedback to an operation amplifier (IC 741), whose output voltage will be a function of temperature. 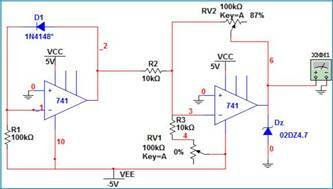 This output voltage will be further amplified by a second operational amplifier and presented as input to an Analog to Digital Converter(ADC). If this thermometer is used in daily life, a digital multimeter/LCD unit will be interfaced to view the reading. The goal of this project is to propose a device which will combine both these capabilities simultaneously. In the circuit designed, operational amplifier IC1 (IC 741) provides a constant flow of current through the 1N4148 fast signal silicon diode. The steady state response and the dynamic response of the diode are used to support this statement. 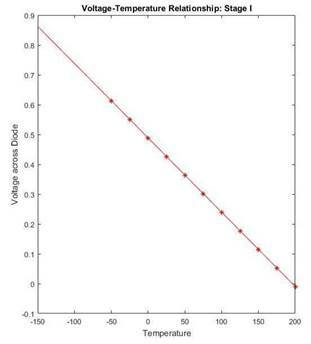 The variation in temperature causes the voltage drop across the diode to change. This change must be linear, in order to get reliable results. The output voltage of this IC1 is thus a function of voltage variation across the diode, which in turn is a function of temperature. This output is amplified by second operational amplifier IC2. Preset RV1 is used to set the zero-reading on the meter and preset RV2 is used to set the range of temperature measurement. T HE use of p-n junction characteristics for the design of systems which employ temperature measurement has been done by many researchers. The most prominent among them is Ocaya , who established the linear temperature-voltage relationship for temperature ranges of 0 Â°C to 100 Â°C in a p-n diode, while describing its voltage, current and temperature behaviour. It was also demonstrated by Godwin  that the 1N4148 diode has linear voltage variations with temperature in the range âˆ’40 Â°C to 150 Â°C. The value of the thermal time constant for the diode(1N4148) was found out to be 390 milliseconds. Maximum leakage for both types at 150Â°C is 50 ÂµA at -20V. 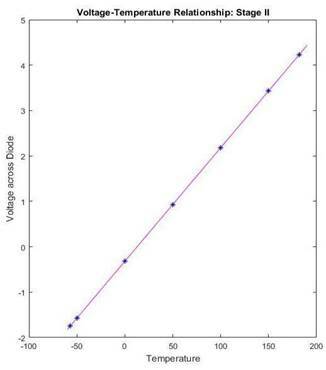 The property of voltage-temperature relation being linear in temperature range âˆ’40 Â°C to 150Â°C is being extrapolated to make a digital thermometer. The critical requirement of today's world is to have an easily portable temperature sensing instrument, fitted with a convenient display unit, for measuring room and body temperature. Most of the temperature measuring instruments available today are either resistance temperature detectors (RTD), thermocouple digital, or thermistor digital thermometers. The dynamic responses of both diode and a thermocouple was carried out and it was found that diode had a larger thermal time constant than thermocouple. Most of these require a current sensing device either for calibration, or for measuring purposes. The expected output voltage range of IC2 op-amp is 0-5 V. This voltage can be given as input to an n-bit Analog to Digital Converter (ADC) which will produce an n-bit digital equivalent corresponding to this voltage. This digital output can be fed to an integrated display unit, or to an LCD / 7-segment display interfaced using embedded systems. [Fig.1.]. Our circuit has one more additional flexibility. Rather than using a separate display unit for displaying the temperature value, the output voltage can be specifically level-shifted and/or scaled so that the numerical value of that scaled voltage in mV is equal to temperature in Â°C. [Fig.2.]. Before the hardware implementation of any proposed design, it must be simulated first in software, and checked if it meets our desired specifications or not, whether it gives expected output or not. Based on these results, further course of action will be decided. This project implements the digital thermometer model using Ngspice. Ngspice is a mixed-signal circuit simulator. Spice was originally written at The University of California at Berkeley (USA).To write a Ngspice code, the circuit must first be drawn on project, and all its nodes must be numbered. Then following the syntax as mentioned on Ngspice manual, the components must be included and connected across the nodes. Ngspice implements various elements, like resistors, capacitors, inductors (single or mutual) transmission lines and a number of semiconductor devices like diodes, bipolar transistors, MOSFETs (both bulk and SOI), MESFETs, JFETs and HFETs. Ngspice supports five types of analyses viz. transient, dc, ac, transfer and operating point. Transient analysis includes transient noise simulation. AC analysis includes small-signal noise simulation, pole-zero and transfer function analysis. The simulation results were recorded and analyzed in Ngspice, and the data was plotted using MATLAB and Microsoft Excel for a better view. 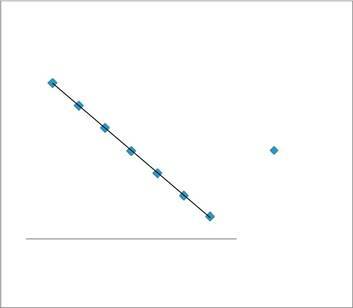 As shown in Fig.5, RÂ² value is very close to unity, showing excellent correlation of the obtained results. As shown in Fig.7, RÂ² value is very close to unity, showing excellent correlation of the obtained results. We compare the specifications of the device desired, and those met by the simulated device.